Jordan is a small country in the Middle East, lying between Israel, Syria, Iraq and Saudi Arabia. Jordan is almost entirely landlocked and has only a small access to the Red Sea in the south around Aqaba. Jordan consists in the west of the Jordan valley with the Dead Sea and in the east of a high plain. Jordan's climate is predominantly dry and only small parts of the country receive significant amounts of rain. Jordan has been ruled by numerous civilizations over its history and has been settled since the Paleolithic period. 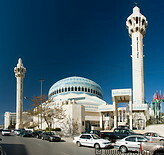 Modern Jordan was created in 1948 as the Hashemite Kingdom of Jordan. Mainly due to recent economic reform initiated under King Abdullah II, Jordan is now one of the most competitive economies in the Middle East. Jordan is a stable and safe country to visit. Its main tourist attractions are the ancient Nabatean city of Petra and the Dead Sea.